enjoyed watching as a kid and still enjoy to this day watching it with my boys. y. In the story Ebenezer is visited by 4 ghosts. The first ghost is his old partner Jacob Marley who warns him about the life he is living and that he will be visited by 3 other ghosts, the ghosts of Christmas past, present, and future. 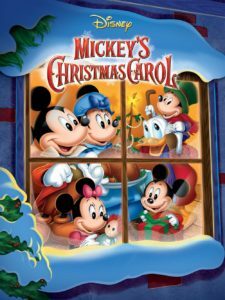 These ghosts help Scrooge see that error of his way of living and offer him a second chance at life. Ebenezer’s response to them is that of a life redeemed. What a wonderful message for this time of year! Although this time of year is one of my favorites, I can at times find myself with the “Bah! Humbug!” attitude of Scrooge. I want to be joyful and merry, but often the consumeristic attitude of our culture and the chaos of the holiday season can have me being a Scrooge myself. How do we avoid the “Bah! Humbug!” that many of us can find ourselves in? How do we recognize that like Scrooge, redemption is available to us? efore Ebenezer is visited by any of the ghosts we get a clue as to what is wrong with his way of thinking. As Ebenezer is on his was to work he is approached by people who ask him if he will give alms to the poor. He replies by saying, “Are there no prisons?…I cannot afford to make idle people merry. I help to support the establishments I have mentioned – they cost enough; and those who are badly off are must to there.” Ebenezer adheres to the philosophy that we reap what we sow, but is this the attitude that God wishes us to have? No! erstanding that God’s economy does not follow the rules of the world. We live in a world were we are proud to say we have something because we earned it and if others worked as hard as me, maybe they could too. That is not the attitude of Christ. This holiday season let us not be bitter, envious, or boastful. Let us be joyful because God sent Jesus into the world to redeem us all, even those that do not deserve it. 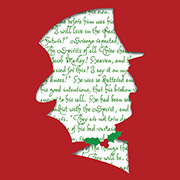 Thats the joyful message of the Christmas carol, if Scrooge can be redeemed then so can we! 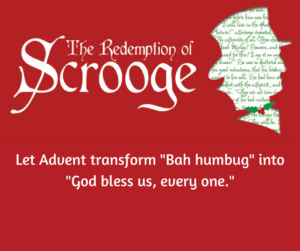 Join us this Sunday at 9:30 AM as we study the “Redemption of Scrooge” in Sunday school and then again at 10:30 AM as we celebrate the “Redemption of Scrooge” in worship.